For anyone looking out for a nippy memory card, it’s important to check out the “read” and “write” speeds to make sure it’s going to be fast enough for your needs and keep up with the action. If you’re just after a microSD card to slap in your phone to listen back to music, top notch speeds (and therefore expensive cards) aren’t going to be that important, but for video makers and keen photographers, fast write speeds can be important. Clearly a man with plenty of time on his hands, Tom David Frey of Tom’s Tech Time was keen to put 10 different microSD cards to the test. In what must have been a very dull afternoon, he got busy testing the cards, using a USB 3.0 card reader to run several programs to examine the actual read/write speeds, and then copied a 4.1GB video file to the cards to test real-world write speeds. Frey worked his way through most of the top-of-the-line microSD cards out there, including the SanDisk Extreme PRO, Sandisk Extreme, Transcend Ultimate 633x, Samsung PRO, Sony SR-32UZ, Kingston, Panasonic, Toshiba Exceria Pro, Verbatim, and Patriot EP Series (in either 16GB or 32GB sizes). 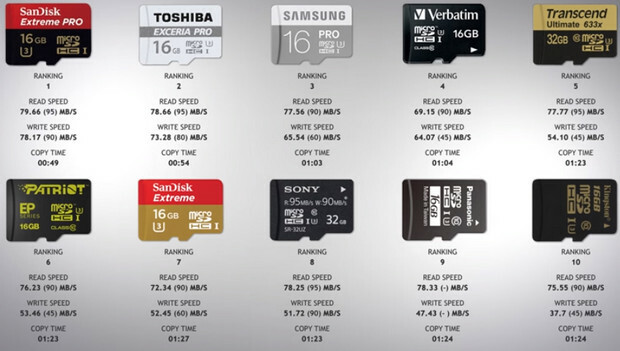 The results were a bit disappointing overall, with none of the cards reaching their claimed read speeds, although the Sandisk Pro MicroSD emerged the overall winner, with the Toshiba Exceria Pro in second place and the Samsung card in 3rd. If you have a little less time than Tom, you can skip straight to the results in the video by going to the 7:30 mark.